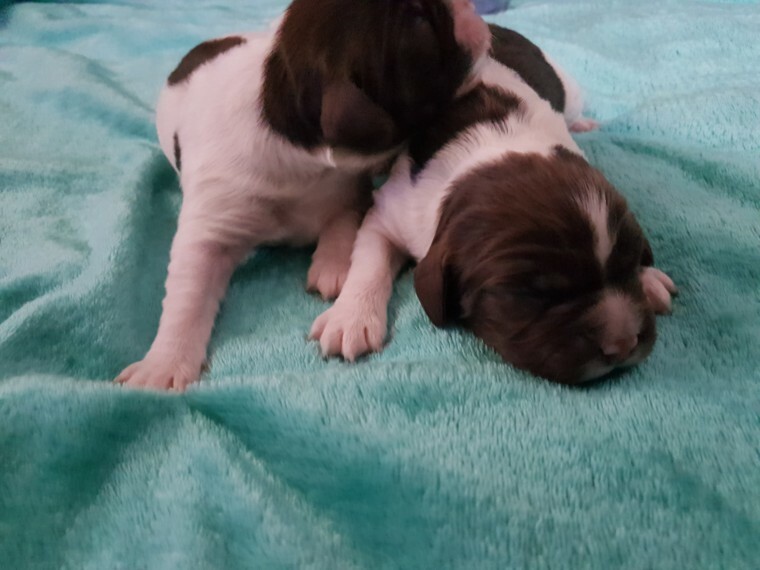 Liver and white English springer spaniel puppies. 2 girls 2 boys All pups liver and white with beautiful markings. Will be wormed, weaned,micro chipped and first set of annoculations. Deposit 150 to secure your puppy. Viewings available. Father KC Registered A purebred working Springer spaniel He Hunts hard & close, has a very good nose, loves bramble and thick cover, he excels in white grass and woodland. Good natural game finding ability Siring quality easy to train pups for all types of field work Trained to Novice/Open Trial Standard His Sire is Cleeburf Fly out of ~ INT FTCH Helmsway Hawk Of Witchwillows. 2nd place at the Irish Spaniel Champs 2010 D.O.M at U.K E.S.S Championships 2008/9 X FTCH Woodstorm Tattinger Dam is Kentelv Bracken Lady out of FTW Wolf's Boy Of Meadowsend X OFTW Queen Of Chorley Solid 5 generation Pedigree including 44/60FTCH DNA Tested and clear of Fucosidosis PRA (cord1) Phosphofructokinase (PFK) deficiency Mother not kc registered but comes from kc breeders Very obedient, loving and loyal. Deposit 150 to secure your puppy. Viewings available.